The mid-Proterozoic (~1.1-1.0 Ga) Grenville orogeny, trending southeast from Quebec to Texas and possibly Mexico, is one of the major events of North America's geologic history. The Adirondack Mountains, in New York state, are a small extension of the Grenville Province, southeast of the Thousand Islands area (St Lawrence River). Figure 1-1. 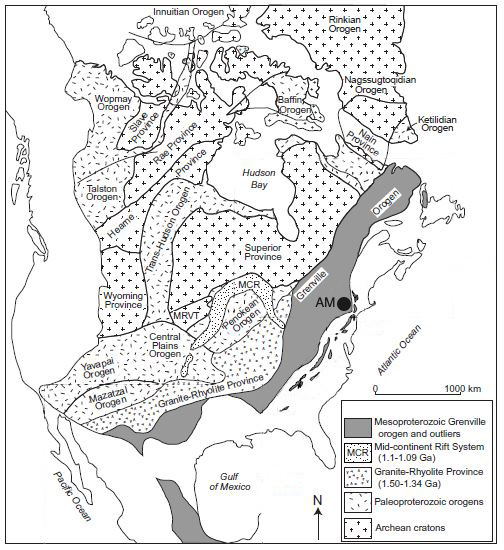 Map of North America showing the Grenville orogen and older geologic provinces. Black circle shows location of Adirondack Mountains (AM). Adapted from Tollo (2004) with permission. The Adirondacks have the general shape of an elliptical dome, approximately delimited by the St Lawrence River valley to the northwest, the Lake Champlain/Hudson river valley to the east, the Mohawk River valley to the south and the Black River valley to the west (actually, the Lowlands and the CCZ continue under the Tug Hill plateau; fig. 1-2). The maximum elevation is 1,629 m (5,343 feet) at Mount Marcy. Figure 1-2. Elevation map of the Adirondack Mountains, New York. Abbreviations: L-Lowlands; H-Highlands; T-Tug Hill plateau; K-Keene. The Adirondacks comprise two distinct regions, the Lowlands and the Highlands, separated by the Carthage-Colton Mylonite Zone (CCMZ). The Black Lake Shear Zone (BLSZ) marks the northwestern boundary of the Lowlands with the Frontenac terrane (New York and Ontario). The Lowlands are characterized by upper amphibolite facies metamorphism, and the Highlands by granulite facies rocks. Moreover, the Highlands are remarkable for the presence of anorthosite, a rock rather rare on Earth (while it composes most of the "white" part of the surface of the Moon). This rock is itself part of the ca. 1.15 Ga (e.g., McLelland et al., 2013) anorthosite-mangerite-charnockite-granite (AMCG) suite. Figure 1-3. 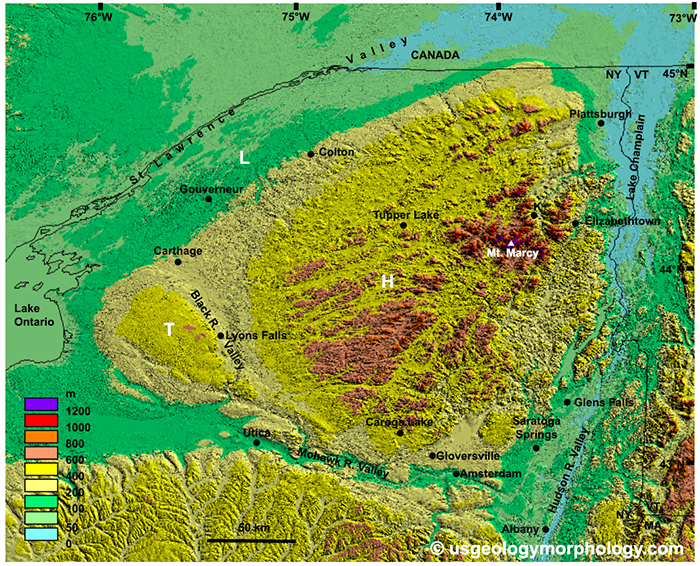 Generalized geologic map of the Adirondack Mountains, New York. The CCZ (Carthage-Colton shear or mylonite zone -also called CCSZ or CCMZ-) separates the Adirondack Lowlands Terrane (ALT) from the Adirondack Highlands Terrane (AHT). Rock units: AMCG - anorthosite-mangerite-charnockite-granite suite; ANT - anorthosite; HERM - Hermon granite; HSRG - Hyde School Gneiss and Rockport granite; HWK - Hawkeye granite; LMG - Lyon Mountain granite; MCG - mangerite-charnockite-granite; RDAG - Rossie diorite and Antwerp granodiorite; RMTG - Royal Mountain tonalite and granodiorite. GM - Gore Mountain; OD - Oregon dome; P - Piseco anticline; SM - Snowy Mountain dome. Towns: A - Antwerp; CA - Canton; G - Gouverneur; IL - Indian Lake; R - Rossie. White areas are metasedimentary rocks, Paleozoic sediments or glacial deposits. Adapted from McLelland et al. (2016) with permission. -the Grenvillian orogenies (Ottawan phase, 1.09–1.02 Ga; Rigolet phase, 1.01–0.98 Ga). Rivers himself changed his terminology and divisions over the time, as the succession of events in the region became better known. In 1997 he considered "pulses" instead of "phases" and included the Shawinigan "pulse" in the Grenvillian orogeny. In 2002 he treated the Ottawan and Rigolet events as distinct orogenies. In 2008, as seen above, he saw the Shawinigan pulse as a distinct orogeny and divided the Grenvillian orogeny into two phases. The Adirondacks are a very complex terrane, with several phases of deformation, folding, magmatism and metamorphism. The history of these mountains only began to unfold after the first U-Pb zircon datings in the late 1960s. Also very useful have been more and more thorough analyses of the composition of rocks, establishing their origin (e.g., arc or subduction zone setting). All began with the rifting of a 1.4-1.3 Ga continental arc on the southeast margin of the Laurentia (proto-North America) continent (some rocks of this arc subsist in the southern Adirondacks). Two crust fragments from the rifting became the CMB (the present Central Metasedimentary Belt, now in Ontario) to the northwest and the present Adirondack Lowlands to the southeast), separated from Laurentia by the CMBB (CMB basin), and Adirondis (name coined by Gower  for the ancestor of the Adirondacks), itself separated from the CMB by the TAB (Trans-Adirondack basin). On the eastern side of the CMB, the nucleus of the future Lowlands formed from shelf and rise sediments deposited in the TAB. 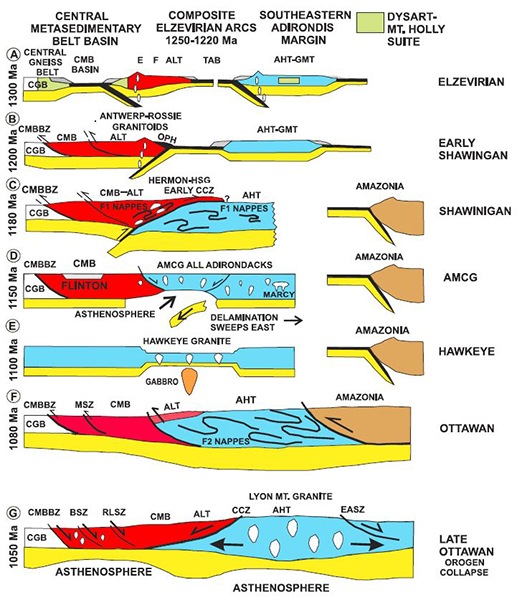 These two basins closed during the Elzevirian orogeny (1.24-1.22 Ga) with the combined subduction to the southeast of the CMBB under the CMB and of the TAB under Adirondis, accompanied by calcalkaline magmatism. Around 1200 Ma, the Shawinigan orogeny began; the TAB subduction reversed to the northwest, i.e. under the eastern CMB-Lowlands, with calcalkaline magmatism in the Lowlands, while some TAB oceanic crust obducted over them (obduction is the opposite of subduction, with slices of crust going above and not under another terrane). The TAB was now closed and Adirondis (the present Adirondack Highlands) accreted to the Lowlands along the CCSZ (Carthage-Colton shear zone). Both the Lowlands and the Highlands experienced deformation and upper amphibolite-facies metamorphism (550° to 650°C at 6 to 8 kbar). Figure 1-4. Tectonic model of the history of the Adirondack Mountains. Abbreviations: AHT =Adirondack Highlands Terrane, AHT-GMT = Adirondack Highlands-Green Mountains Terrane, ALT = Adirondack Lowlands Terrane, AMCG = anorthosite-monzonite-charnockite-granite suite, BSZ = Bancroft shear zone, CCZ = Carthage-Colton Shear Zone, CGB = Central Gneiss Belt, CMB = Central Metasedimentary Belt, E = Elzevir Terrane, CMBBZ = Central Metasedimentary Belt Boundary Zone, EASZ = Eastern Adirondack shear zone, F = Frontenac Terrane, HSG = Hyde School Gneiss , MSZ = Maberly Shear Zone, OPH = Pyrite Ophiolite Complex, RLSZ = Robertson Lake Shear Zone, TAB = Trans-Adirondack basin. Reproduced from McLelland (2013) with permission. © Geoscience Canada. At ca. 1150 Ma, after the Shawinigan orogeny had ended, AMCG plutons rose in both the Lowlands and the Highlands, followed at 1100 Ma by the Hawkeye granite intrusions. The Ottawan orogeny occurred here between 1090 and 1040 Ma when a continent (probably Amazonia, during the assembly of the supercontinent Rodinia) collided with Laurentia. This Himalayan-style collision induced deformation and granulite-facies metamorphism (700° to 800°C at 6 to 11 kbar) in the Highlands (which for that reason are part of what is called the Central Granulite terrane). The Ottawan orogeny is the first phase of the Grenville orogeny; the second phase (Rigolet) has not affected the Adirondacks, except for some zircon overgrowth. At the end of the Ottawan orogeny, the crust thickness may have reached 60-70 km (twice its normal size) and as a result of their weight, the Highlands collapsed (Mezger et al., 1991) along the CCSZ in the northwest, and the EASZ (Eastern Adirondack shear zone) in the southeast, while they were intruded by the Lyon Mountain granite. Unlike the CCSZ, the EASZ is little visible, probably being buried under more recent sediments. Presently, Late Cambrian to Ordovician unmetamorphosed marine sediments (the oldest being the Cambrian Potsdam sandstone) lie unconformably above 1.1 Ga rocks; it means that the Adirondacks had been completely eroded and that 20-25 km of rock had been removed in less than 500 My, which represents a rate of more than 4 cm/1,000 years (Selleck, 1980), before a sea invaded the area. Later, these Paleozoic sediments were partially removed, revealing the Proterozoic rocks. 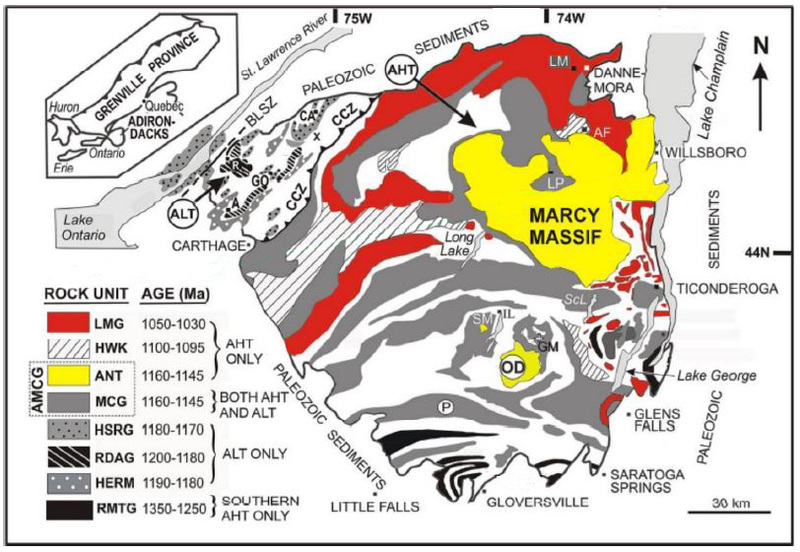 Apatite fission track (AFT) ages show that unroofing of the Adirondacks took place between Middle Jurassic to Late Cretaceous, from 168 Ma to 83 Ma (Roden-Tice et al., 2000 and 2005). Exhumation began in the High Peaks, where at 170 Ma (Middle Jurassic), present Mt. Marcy was still buried at a depth of 4 km, and continued until the end of the Early Cretaceous. In the southeastern Adirondacks, maybe because they were covered with debris from the High Peaks, unroofing was completed only in the Late Cretaceous. Unroofing was caused by regional uplift which gave the Adirondacks its domal shape. A low-velocity zone under the Adirondacks may be the remnant of the passage of the Laurentian plate over the Great Meteor hotspot (named after the Great Meteor Seamount in the eastern Atlantic) in the Early Cretaceous. Replacement of delaminated mantle lithosphere by asthenosphere over the hotspot would have caused the uplift (Taylor et al., 2011). However, for Miller et al. (1983), the low rate of exhumation (0.025 to 0.05 mm/yr) doesn't require a hotspot origin. Today, for still uncertain reasons, the Adirondacks continue to rise at a rate of 3.7 mm/yr (Isachsen, 1975 and 1981).